Evaluating how well bactericides, nutritional programs or other treatments work against HLB can be difficult. Symptoms are not uniform between trees in a grove, and tree health fluctuates throughout the season, which may give the appearance of an effect. Rigorous field trials are the best way to test new treatments, but not every treatment program can be tested in this manner. Growers can, however, gather some information on the changing health of a grove by choosing a small number of trees to follow throughout the year. Trees can be scored based on severity of symptoms when treatments are initiated and every six months thereafter. This disease scoring is called disease indexing (DI). 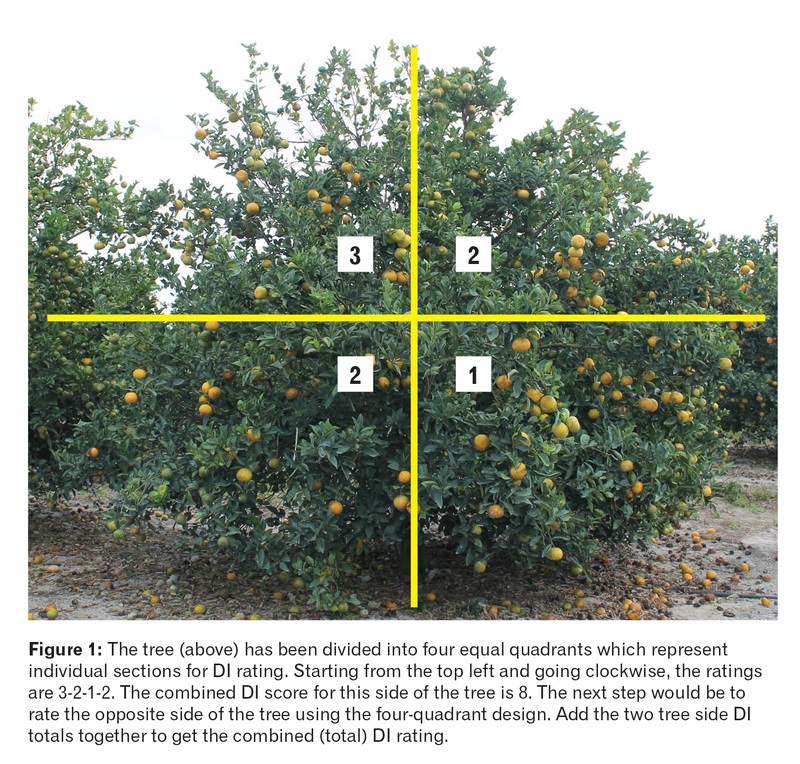 University of Florida’s Jim Syvertsen and Brandon Page, the field trial administrator for the Citrus Research and Development Foundation (CRDF), have developed DI parameters to evaluate CRDF field trials. The framework of this method is based on the methods of T. R. Gottwald, B. Aubert and Z. Xue-Yuan. These methods evaluate the canopy by dividing each side of the tree into quadrants and assigning a single score from 0 to 5 to each quadrant. The reason for using this method is that the symptoms of HLB are not regularly distributed in the canopy of an infected tree. By dividing the canopy into quadrants on each side of the tree, the uneven distribution of symptoms in the canopy is taken into account. CRDF has developed a rating system to score each quadrant: 0 indicates a tree with no visible symptoms while 5 indicates the highest level of severity. Each of the quadrant scores are added together, with a maximum score of 40. We find that this is a more robust method compared with methods that score the tree as a whole. For CRDF field trials, trees with a DI around 20 are selected to evaluate because this indicates a moderate level of disease severity and we could expect some improvement with an effective treatment. A minimum of 20 treated trees and 20 untreated trees is recommended for disease indexing. 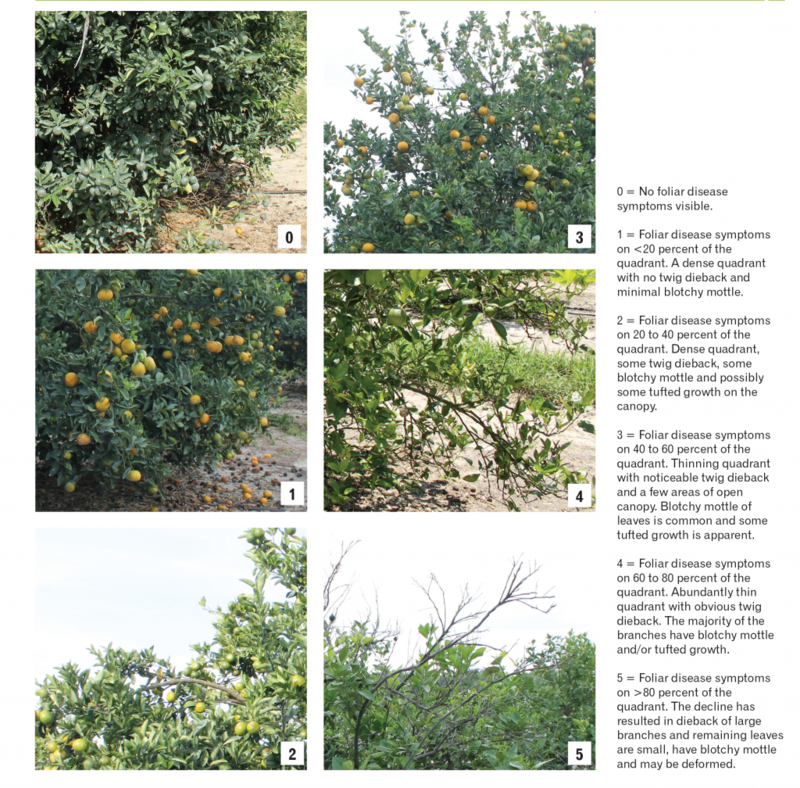 The selected trees should be initially similar in disease severity, which will limit the variability within the treated and untreated trees and make comparisons easier. In-depth instructions for setting up a simple field trial can be found here. Getting a DI rating is rapid and should require no more than 10 to 20 seconds per one side of the tree for one person. For consistency, the same person(s) should rate trees each time. If a team is doing the rating, it should work together so that all team members rate both untreated and treated plots. Disease indexing should take place before treatments are initiated and at 6-month intervals. A positive effect of a therapy for HLB-diseased trees would result in building new phloem and canopy improvement. Therefore, a clear treatment effect likely takes a minimum of six months in young, relatively healthy trees and one year or more for larger and more severely infected trees. Facing the tree, divide the first side of the tree into quadrants by imagining a vertical and a horizontal line at mid-canopy height. Score each quadrant individually for visible symptoms on the 0 to 5 scale and combine the scores. Rate each quadrant on the opposite side of the tree from 0 to 5 in the same way, and combine the scores from each side of the tree for a total DI score of 0 to 40. Figure 1 shows an example of how one side of the canopy is scored. CRDF continues to find ways to assist growers in assessing tree health and treatments, in addition to coordinating a broad program to develop and deliver solutions through sponsored research and working with private industry. Stephanie Slinski is the bactericides project manager for the Citrus Research and Development Foundation in Lake Alfred.